Lock Kieran Treadwell admits Ulster reaching the European Champions Cup quarter-finals would mean everything to the squad. Ulster travel to Welford Road to face Leicester Tigers in their final Pool Four game of the campaign in the knowledge that a win will guarantee them a place in the last eight for the first time since 2014. Even a loss against the Premiership side could even see Ulster progress, provided other results go their way. 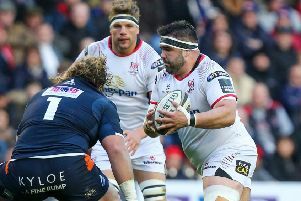 Ulster defeated group leaders Racing 92 last weekend 26-22 at Kingspan Stadium to stay in the mix. Treadwell admitted there was a certain level of euphoria around the performance and the win, the job was only have done and the focus had quickly switched to getting that job done this Saturday. Few of the current squad have reached a knockout game with Ulster and Treadwell said it would be tremendous achievement to make the last eight in Europe. “It would mean everything to get to quarter-finals, but we are a team that do focus week on week and sort of nothing really changes within week on week,” he said. “We know what Leicester bring and we do have an eye on them, but we do focus on ourselves.